As a buyers broker, I enjoy the search and the process of matching the buyer's vision with the realities of the market. Once I am familiar with a clients interest, I will look at both offmarket potential and advertised properties to try to find the best match. I enjoy considering all of the opportunities and working closely with my clients to help recreate their vision in an affordable and practical solution. Sometimes this is as simple as careful listening. Sometimes it takes creativity, sketches and discusion to demonstrate how an existing property can be gently transformed to match a clients dream. In these cases I rely on design skills to show the potential of a property which may not be obvious at first glance. 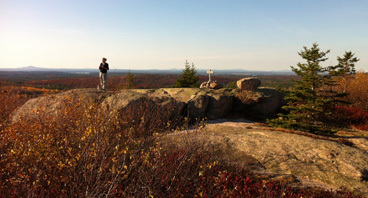 Buying property in a popular vacation spot such as Acadia National Park can be complex. There several unique towns on Mount Desert Island and the surrounding area. Each has its own character, ordinances, price and more importantly its own opportunities for creating a lifestyle. In addition to finding the "right place", I have years of experience in negotiating effectively to close the deal. Through this process, I have made many lasting friends and helped them to realize their dream of a home in Maine. Jim, Please accept this as a token symbol of appreciation for all the work you did, well done and beyond the call of duty. Your work ethic is extraordinary. We are truly delighted with our new home and look forward to being members of your community. Dear Jim, Thank you so much for all your hard work on our behalf. You have helped make our Maine dream a reality. We love the picture you drew of what will forever be called picnic rock. A touching gift that will always be very special to us. Dear Jim, Just wanted to thank you for the wonderful drawing of this so far "unnamed house" Seriously, you were very kind to present us with it and I have hung it prominently. I love the changes you made to the float and the closing date as the signed date. I do love this place. Thanks for talking me into my first look. The view is spectacular. Binoculars and bird book live by the kitchen sink. Jim, I am touched by your kindness at the end of our real estate journey together and I am happy to have made a new friend. I love my new place. I will need to buy a new table for my new coffee table book. Dear Jim, As you know we are absolutely in love with the cottage you found for us. We cannot thank you enough. When we first met we were really quite lost. We knew we wanted a home in the area. It was a special kindness to us to explore all the alternatives and to introduce us to the area. That took extra time and effort on your part to understand us and how we told you we wanted to use the property. You listened carefully and proposed solutions that helped us eventually find the cottage that met both Pats and my vision. Your ideas about how to use the property made it easy to fall in love with it. You allowed us to dream and sent us pictures of the cottage in the fall and winter. We think of the cottage every day and its photo album now rivals that of our grandchildren. Your help and delicacy towards negotiating with sellers who loved the cottage for more than forty years and could barely stand to let it go was touching and effective. You helped them understand that we would love the place as much as they had loved it. There are few people that would have shared your skills and values and we deeply appreciate your using them on our behalf. PI & LI, Cambridge, Mass.